Happily announcing the newest addition of Xtreme Force Wheels custom truck rims to our online aftermarket car and truck products inventory. Bringing to you the already preexisting lines of XF-1, XF-2, XF-3, XF-4 & XF-5 in varying designs and finishes consisting of; Glossy Black Milled. Black wheel with a machined face. Black wheel with a silver full brushed face. Chrome and a Silver Full Brushed finish as well. Designs ranging from modest and intriguing, to creative choices that spark instant captivation. Also introducing their newest lines of ‘True Directional’, wheels. Models XF-6 & XF-7 in; Glossy Black Milled. Black wheel with a silver brushed face. Chrome, and a Silver Full Brushed finish, to really catch the eyes and make people turn their heads. See all the new and existing models of Xtreme Force Wheels here: Xtreme Force Wheels. 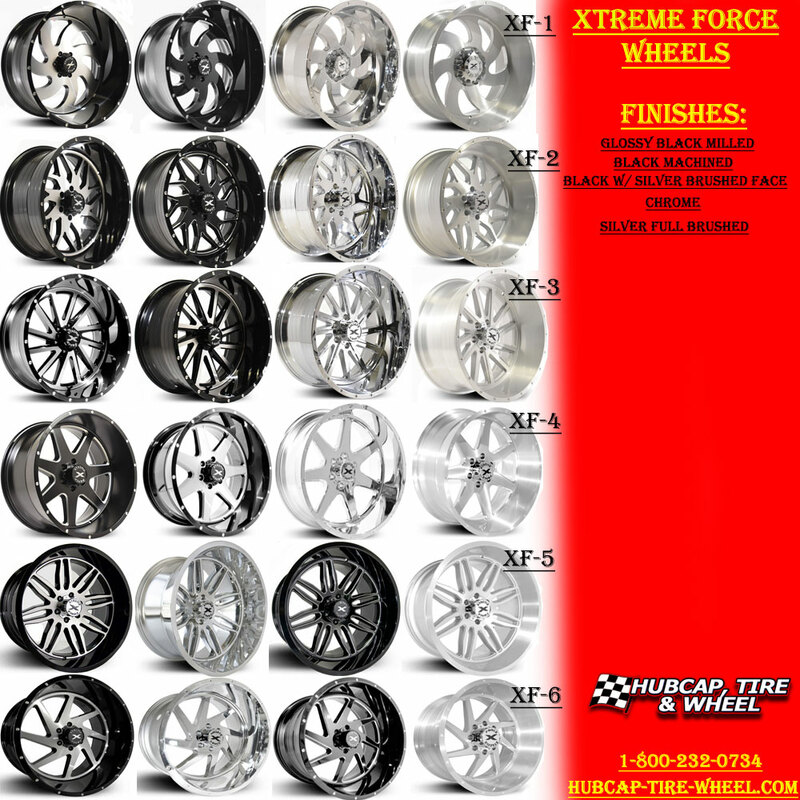 Xtreme Force Wheels produce some of the best quality custom products available today. They do extensive testing and have broken into the mainstream to compete directly with the big names in the custom wheel industry. Despite being new to the already vast custom rim business, they have set standards and criteria for themselves that set the Xtreme Force Wheels company name apart from your run of the mill, custom wheels that can be procured with other companies. If you’re interested in Xtreme Force Wheels or any other rims that we carry, please give us a call at: 1-800-232-0734. Our wheel and tire experts are ready and willing to assist you get the perfect fit for your vehicle. With over 100 years of combined experience between our staff, you’re guaranteed to receive precisely what you’re looking for. If you wish to reach us outside of business hours you can go to our web site and peruse our inventory along with submitting any questions or concerns to our online messaging center.